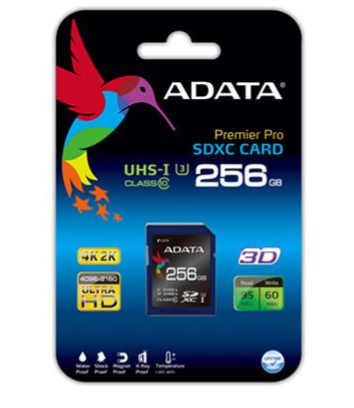 ADATA’s Premier Pro series of SDXC UHS-I Speed Class 3 (U3) high-speed memory card delivers enhanced performance with read/write speeds up to 95/60 MB/s. It fully supports the latest 4K2K photographic devices, and enables the capture of professional grade ultra-fine high-quality images. With seamless high-speed transfer of large files, Premier Pro memory cards finally allow you to fully enjoy the power of burst mode photography. The high performance, reliability and durability of SDXC UHS-I U3 memory cards enables professional photographers and enthusiasts to capture every fantastic moment with the utmost precision.